Everyone should eat more fatty fish; it's high in omega-3 fatty acids and other healthy fats. Plus it tastes great! In the summer, grilled salmon is great, but salmon salads are my favorite. These top ten salmon salad recipes are all delicious and so easy to make. Salmon combines with fruits, vegetables, and pasta in flavorful dressings to make these easy recipes. Try honey mustard salmon salad or my new favorite: curried salmon waldorf salad. As a bonus, each recipe makes a big bowl, so you can leave it in the fridge and just eat it until it's gone. Dinner made super easy! Honey mustard salmon salad is the perfect for dinner on a warm summer night. 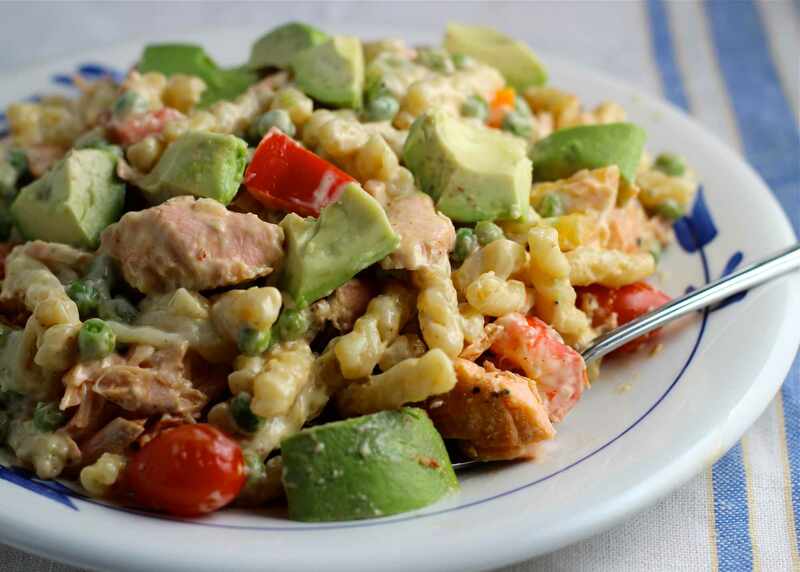 Mustard and salmon are wonderful partners in this mustard salmon pasta salad. The spicy hit of mustard complements the smooth texture and nutty, mild flavor of the salmon in this easy salad recipe. Bacon and broccoli add the perfect finishes touches.